Computer telephony integration (CTI integration) is a technology that integrates phones with computers in a way that the two can interact and communicate with one another. Computer telephony integration makes it possible for companies to use computers to manage call centers and phone support. With Zendesk, all customer interactions and data are stored in a single location, meaning call center agents always have the context they need to provide great support. Traditionally, using the phone as a support channel was not a digital process. Records needed to be manually recorded, making it not only time consuming but difficult to sort through for later use. Performance of both individual agents and the entire department was difficult to measure, because the phone system could not integrate with other business and communications systems. Additionally, call center professionals more or less worked blindly because incoming calls could not be identified until the call was already answered. All in all it was not a very efficient process. Agents made dialing errors, call forwarding was problematic, and without simple ways to measure performance, improvement was almost impossible. Luckily all of this can be solved with computer telephony integration. Advanced caller ID. Companies can automatically capture details about customers so when they call, the agent will have access to that information before they even answer the phone. Endless integration possibilities. Computer telephony integration makes it possible to sync the data from phone calls to CRM, ticketing, and ecommerce systems, ensuring phone calls data doesn’t get siloed. Metric reporting. With CTI integration it’s possible to easily measure important metrics like average call time, number of issues resolved with one call, and customer satisfaction. Companies that put a heavy emphasis on providing support over the phone should consider computer telephony integrations. It allows them to take an older technology that is still preferred by many people and update to the digital age. This opens up the telephone to a robust set of possibilities that will ensure customer satisfaction and improve the impact of phone customer service. 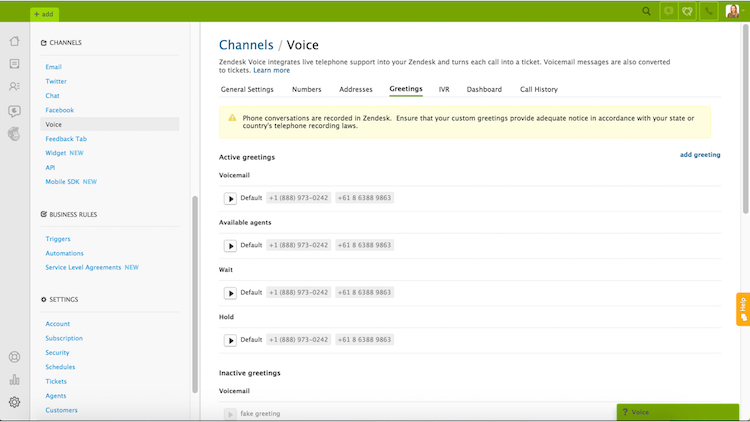 Zendesk customer service software integrates with many telephony business applications, allowing companies to take their phone support into the digital age. Call forwarding, autodialing, metrics analysis, advanced caller ID, and many, many other advantages are only ever a click away. And with Zendesk, all customer interactions and data are stored in a single location, meaning call center agents always have the context they need to provide great support. There are many ways to take better advantage of offering phone support for customers. Learn more today.